I've had food on the brain - you may have noticed. Here's another recipe that I have to share because it is a truly decadent and authentic cheesecake. Five eggs, five packages of cream cheese. It doesn't get more indulgent than this. This is my favourite type of cheesecake, and the recipe is from one of my favourite restaurants. Victoria, BC, was our home for five years. A wonderful city, in a beautiful part of the country. 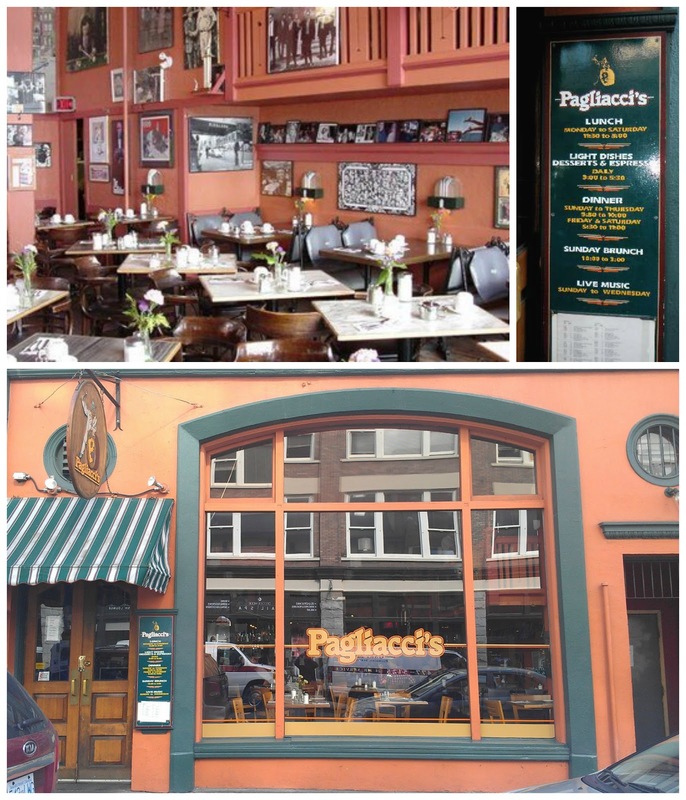 Pagliacci's still holds a special place in my memories, and I vow to make it back there one day. Some places just stay with you, and this place was meant to, with it's excellent Italian food, great atmosphere, and amazing dessert menu. Their New York Style Cheesecake was my usual choice, and one day while eating there I noticed an article posted on the wall beside me, printed in Bon Appetit magazine, listing the recipe for the very cheesecake I was eating. I copied it onto a napkin with a lip pencil from my purse, transferred it to a recipe card when I got home, and I've been making it ever since. Mix crumbs, 1/4 cup sugar and butter and press into a 10" spring form pan. Refrigerate until ready to use. Beat cream cheese with electric mixer in large bowl until very smooth. Blend in lemon juice and vanilla. Sift sugar, flour and salt together and gradually beat into cheese. Beat until creamy, smooth and light, about 5 minutes. Beat in eggs and yolks one at a time. Blend in cream. Pour into crust. Reduce oven temperature to 200ºF. Continue baking until tester inserted in centre comes out clean. The original recipe said for 45 minutes but I find that it takes longer. Found this via Pinterest. What a lovely cheesecake! I will be making it today and I HOPE I can wait the 24 hours to let it sit in the refrigerator. Just discovered your blog - the recipe for the Starbucks Lemon Poundcake sounds wonderful. I love to experiment with cheesecake - this one is next. This one looks so perfect! I'm from NY and this looks like the real thing...beautiful cheesecake and the city is gorgeous too. It would be great if you shared this recipe on my foodie friday party today. Done, thank you :) Seeing NY up close and personal is on my bucket list! It is interesting and intense in NYC but it doesn't look to be nearly as beautiful as Victoria. I absolutely love cheesecake! This recipe looks really good. Love the photos you shared. Thanks for joining Foodie Friends Friday! Please come back on Sunday to VOTE! Following you now! Thanks for sharing at Foodie Friends Friday Crocktober Party! That looks so good! I'm so glad I found you! This looks absolutely wonderful. On visiting New York 5 years ago, the request from my brother was a piece of proper cheesecake. So armed with a plastic pot, before flying back to the UK we purchased him a piece. Then cradled it through the airport and all the way home. The response that was amazing where is the rest! All the recipes I have found so far have been nothing like it, this looks like the real thing and I am off to try it out. If it is that is a Christmas present taken care of and I will have a very happy brother. What a great story, thanks for sharing! I love cheesecake and this one really is a winner in my eyes... I hope yours is a success! There is nothing better than a good slice of New York cheesecake, and yours has me now drooling! I love B.C.--one summer I went to school in Langley, and I just loved it there--gorgeous. Thank you! BC is truly beautiful...we were very sad to leave! This looks amazing!!! We'll have to try it soon (; Just found your blog via Say Not Sweet Anne and became your most recent follower (: Can't wait to come back for more posts...Hope you have a lovely week!! I've never made a recipe for cheesecake that called for heavy cream - wow. It looks beautiful. My next holiday offering. Your cheesecake looks AMAZING!!! So creamy. I wish I had a very large slice right now! A big hello from Vancouver Island. I was visiting some new blogs tonight and saw this linky party and what stood out Pagliacci's cheesecake. I first started going there almost 30 years ago when I just moved to Victoria. I was hooked on the bread lol. Great to see pictures of Victoria. It is absolutely pouring out right now on this October 30 night. I am a new Canadian Follower of yours now. I live in Shawnigan Lake presently. It looks like you are in Ontario now. Will have to check out the rest of your site. We've been back in Ontario for 15 years now but I LOVED living in BC. I'd forgotten about the bread at Pag's. Thanks for the reminder. I would soooo love to go there again! Heading over to Daisy Express for a visit! i looove cheesecake. this looks ridiculously delicious! Thank you Daphne! I hope you love this cheesecake as much as I do:) Waving at you from cold and rainy Ontario, Canada! Your cheesecake looks gorgeous! I can tell by your picture that the texture has to be amazing!! Thank you so much for joining in at Mom's Test Meal Mondays!! Newest follower here! I found you through the Wednesday link up! Cute blog, I can’t wait to read more! Wow! Sounds amazing -- a perfect holiday treat! Thanks for linking on Busy Monday! That looks SO AMAZING!!! Thanks for linking up at Romance on a dime. Hope to see you again today. That looks so yummy, can't wait to try it! You were featured today on my link party, If you would like a featured button, I have them here: http://printabelle.com/?page_id=724 Thanks! WOW this looks amazing!! Saw you linked up on a bunch of link parties. Would love it if you linked up on my blog hop and added it to your list www.w-t-fab.com/search/label/bloghop. Also let me know if you'd like to follow each other! I absolutely adore cheesecake and this one looks so moist and delicious. Thanks for sharing on Tout It Tuesday! Hope to see you next week. Thanks for linking up to Pin Me! I've pinned this! Decadent indeed! Thank you for linking up with the Clever Chicks this week; I hope you’ll join us again! Pagliacci's has been one of my favourite places for decades. I love their cheesecake. I'm really looking forward to giving this recipe a try. I've pinned it to my sweets board. OH I LOVE CHEESECAKE, this one looks so light and fluffy! Thanks so much for sharing @ Miss Information. Your cheesecake has such smooth texture....love it! Bookmarking for future bakes:D Thanks! I had decided to make cheesecake for dessert for our Chanukah party and you just gave me the recipe. This looks luscious. 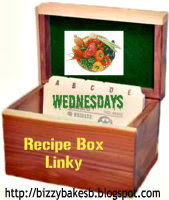 Thanks for sharing at the Recipe Box. YUM! Cheesecake is my favorite--and this looks delicious! Thanks for the recipe. And I'm pinning this to my Cheesecake board. New follower from the Addicted to Recipes hop. Jenn, Wow!This really is REAL cheesecake. Nothing like it. Thanks for sharing the recipe in our Pin'Inspirational Thursday Linky Party! It's the real deal :) Thanks again for hosting! Loving the blog! That cheesecake looks AMAZING! I am following through the blog hop! Victoria is what I consider my home town, we only get to visit for a few weeks each summer. We've been to Pag's many times, though I never have room for dessert, so I've not had the cheesecake. It looks amazing, so creamy and delicious! and making your cheese cake.. yummmm! This makes me want a piece now but I live in Honduras and it's not going to happen. I'll have to wait until I make it myself. Thank you for the recipe. It looks absolutely luscious. 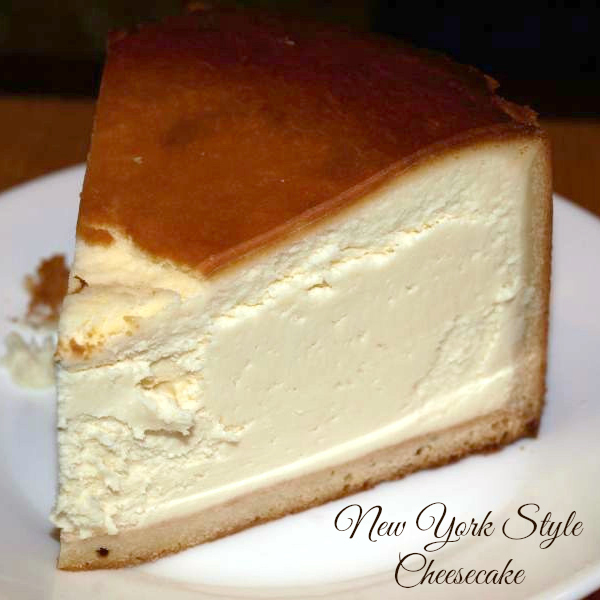 This looks so great, I had to check it out and pin it for my Mom who LOVES NY cheesecake. I found you over at Miz Helen's Full Plate Thursday :) Thanks for sharing. I get to where I am just in a recipe posting mood. You know it really does look like cheesecake you get from the Cheesecake Factory or the other one, I believe it is Carnagie Deli! MMMM. That is beautiful. Thank you so much for linking up with me today for my first blog hop link up Jenn. I hope you will stop by again next week. I will be sharing the love via Facebook for your delicious recipe. That cheesecake looks deadly! I'm just stopping in from Freedom Fridays. I'm a new Pinterest follower! Your Cheesecake is so elegant and looks delicious. Hope you are having a great weekend and thank you so much for sharing your awesome recipe with Full Plate Thursday. looks so much easier to make than i would have thought! Thanks so much for sharing at the Humble Brag! Oh my - your cheesecake is stunning! Just look at the creamy texture. Wow, I'm hungry for some.... love it!! That looks delicious. This may be the first cheesecake I attempt to make. I have just taken this beauty out of the oven..oh.my.God. ! It baked up very high above my pan though. Is this normal? 24 hours?....Don't know if it will last that long but I will try!!! OMG that cheesecake looks super tasty!And so does everything else in your blog ^^Dropping by from the Friday Flash Blog Hop. 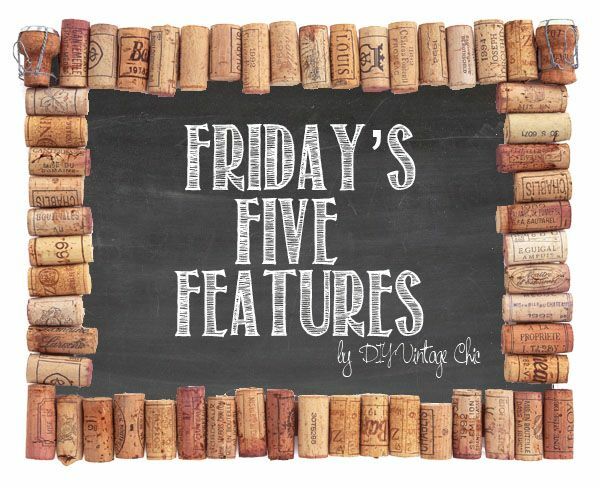 Finally linking up with my Friday Flash Blog community. Thanks for linking up and sharing in the fun! Have a terrific week and see you on Friday. How do you wait 24 hours?? :) This has to be divine! I will definitely try it. This looks delicious! Thanks for sharing at this week's Throwback Thursday party. I live in Victoria BC and love Pagliacci's and their NY style cheescake. I am sooo glad that I found your site and their recipe. Thank you for sharing. Hi this looks and sounds amazing and I LOVE cheese cake, I pinned it and thanks for sharing at Mums make lists party. G'day! Looks fantastic! I can almost taste this from here! Jen, this looks so awesome. Worthy of a fine restaurant or bakery! Pinned it to my Cheesecake Yum! board. If you haven't stopped by today's blog hop on Ducks 'n a Row please do. Feel free to share this post and any others you'd like to! My readers will LOVE it. This recipe is so near to the one that I make that I just combined the two differences and it is in the oven now. My Mother found a New York Style Cheesecake recipe in the Sun News, in Myrtle Beach, SC probably 25-30 years ago and it was the first time I had ever had cheesecake. Now I continue making this for my family. The recipe I have lists orange and lemon zest in the ingredients and does not have the vanilla extract. So I used them all. My cooking directions were mostly the same. I am excited to have a slice of this with the vanilla and lemon juice :) I will let you know how it turns out. Thanks for sharing too! it was a bit lemony, so I made mine without the added lemon juice but including the fruit zest. Anyway, I took them both to work today and your recipe was gone before I left work. I came home with 2 slices left of mine. Both were enjoyed by all! Thanks!! Have made this twice now and have shared with family and friends. They all think it's better than a bought cake from the store. Yummy!! Thanks for sharing! I'm going to try this recipe. Can't pass up a good cheesecake:-) Thanks for linking up and sharing with us at Funtastic Friday. Please join us again for this week's party. I love that you used a lip pencil to copy down the recipe! I would have done the same - although my kids caught me doing something like that, and suggested I just snap a photo with my phone! Amazing what a few years of improved technology (and the advice of a teenager) can do! I can't wait to try this. I'm glad visited your blog at the Motivational Monday linkup today. Hi Jenn, thanks for sharing this awesome cheesecake recipe at our Cooking & Crafting with J & J this week! Cheesecake is my best friend! Thanks for the recipe of a classic! Saucy Saturdays is forever grateful! This looks exactly like the cheesecake my dad used to bring home every weekend when I was a little girl! I am going to be making it...and enjoy it. Thanks for sharing. Oh wow...this looks so delicious! A stunning dessert--it's featured tonight at Foodie Friday and Everything Else! Cheesecake is a fav, and this looks amazing!! Thank you so much for linking up at Tasty Tuesday! This post has been pinned on the Tasty Tuesday Pinterest board! I love having you and can't wait to see you next week! Wow that cheesecake looks amazing and so decadent - Thanks for linking up to Pin Worthy Wednesday, I have pinned your post to the Pin Worthy Wednesday Pinterest Board. do you use water bath for this? IF no does it crack? Hi, sorry, do you use a water bath /Bain Marie for this? IF no, does it crack? I have not baked this in a water bath, but I do sometimes put a pan of water on the rack below the cake. So far I haven't had any cracked cakes. Thanks for visiting! I'm making this right now. Is it supposed to be 500 Fahrenheit and 200 Fahrenheit? I think it's been in there for almost 2 hours now at those settings, I've put it up to 300 - any insight?? Thanks! I made this a couple of weeks ago and it is by far the best tasting cheesecake I've ever made!! It's also the first one that has ever cracked on me lol. It was my own fault though for not letting it cool right. I recommend this to anybody who is looking for the best cheesecake!!! Thank you so much for sharing this!! I have made this twice and it is fabulous. The cook time at 200 degrees is lengthy, and is about 90 minutes in my convection oven, but that may be because I bake this in a one inch water bath. I also double the vanilla and lemon for a really rich taste. Hello from Vancouver Island! I lived in Victoria for several years and yes, Pag's is the best! This recipe looks very similar to one that I make but no whip cream. I will definitely try it. What have I got to lose? and...I get to eat cheesecake. That's a win-win in my books!